Since 1998 – 1999, enrolment in French-language public schools has increased by 73% and it is still rising. In fact, in recent years, enrolment in French-language public education has risen faster than in any other system. With 129 elementary and secondary schools, the province’s French-language school boards are proud to be able to welcome Francophone students and to offer them an inclusive, high-quality education. In our schools, high-quality education means innovation, respect for the individual, and students who are open-minded, empathetic, engaged, bilingual citizens of the world. Almost 2 150 students attend CSPNE 13 elementary and secondary schools and its learning centre. CSPNE has schools in the communities of Timmins, Iroquois Falls, Kapuskasing, Hearst, Temiskaming Shores, Sturgeon Falls, and North Bay. Parce que je vois grand! CSPGNO welcomes nearly 2 500 students in 19 elementary and secondary schools. CSPGNO has schools in the communities of Markstay, Noëlville, the City of Greater Sudbury, Elliot Lake, Sault Ste. Marie, Wawa, Dubreuilville, Marathon, Manitouwadge, and Longlac. Conseil scolaire Viamonde covers a vast area, from Windsor east to Trenton and from Penetanguishene south to the Niagara Region. Its 53 elementary and secondary schools are home to more than 12 600 students. 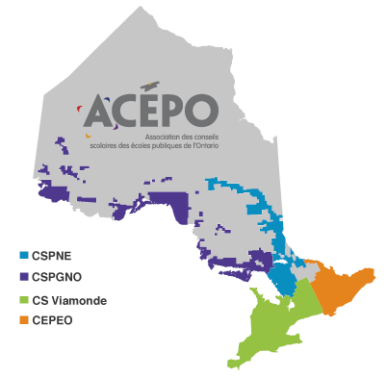 CEPEO is based in eastern Ontario, has nearly 16 300 students and 43 French-language elementary, secondary and adult schools from Trenton to Hawkesbury.